After watching this episode and the one before it, I feel like we’re starting to really get into the weeds of the story this series. We’re finally up to date with introducing the main cast and their Stands, now we can throw them into some harrowing situations as they continue their body guarding job of the Boss’s daughter: Trish. 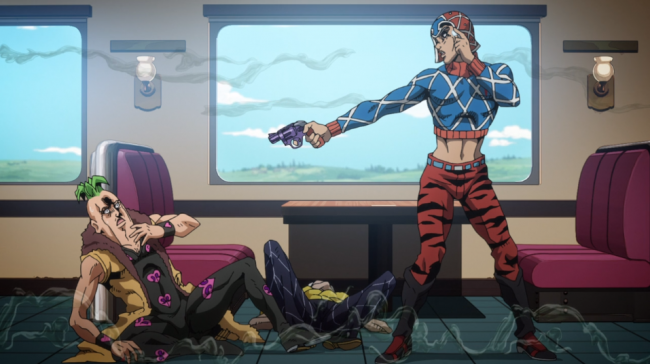 At the end of the previous episode, Old man Mista made the unfortunate discovery that there were two enemy stand users on the train with them and he got a stand based fishing hook lodged into his body. Yet more grotesque imagery for the scrap book. Mista manages to free himself from Pineapple’s fishing hook as he is dragged through the train, quickly gaining the upper hand on the bumbling hit man. I already like Mista quite a bit. Me might have an obnoxious talking stand, but he seems to lack the varied personality defects that plague the rest of the gang and generally a decent guy. Things take a turn for the worse though when Prosciutto reveals he can manipulate his own age and gets the jump on Mista, disarming him and ageing him to the point of uselessness. 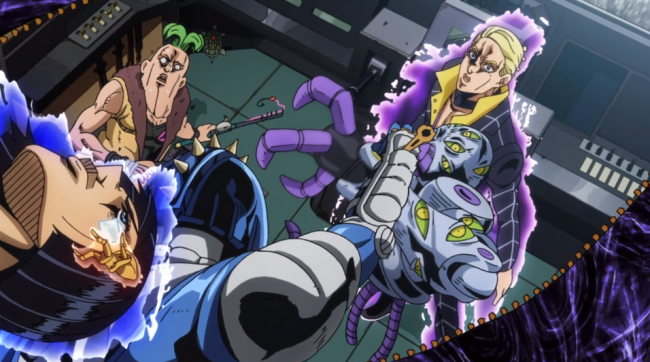 I can tell Prosciutto is going to be an enemy to be reckoned with though, because rather than gloat about his power, he just grabs Mista’s gun and pops him three times in the skull. I was shocked, although Jojo is not above just killing off major members of its cast, this felt pretty early on to be taking out major characters. I should have realised, this is Jojo and nothing is a guaranteed death, no matter how convincing. I mean, his stand ability is to control bullets, of course shooting him would not work. The second half of the episode begins on a worrisome note as the assassins find the group inside their turtle house, only to be ambushed by Bucciarati. Thereafter we get a cool fight sequence between the two, who seem pretty evenly matched. Ending on a pretty gripping cliffhanger in which Bucciarati zips the train in half, leaving him and his foe to plummet from the speeding locomotive. So far, Golden Wind is holding true to the Jojo tradition that began in part 3 for me in which there are several characters I like more than the focal Jojo of the series. Both Bucciarati and Mista doing a lot more for me than Giorno, who seems like a little bit dull and lacking in any real character defining traits to make him stand out. Especially when compared to the likes of Joseph and Jotaro. The fast pace and high action approach to this series story is working for me though. As much as I did enjoy Part 4, it felt too lazily paced at times thanks to it being more of a slice of life style show. The show continues to be funny, the style is as crazy as it’s ever been and the punches still sound like cannon blasts. Let’s keep this train rolling. 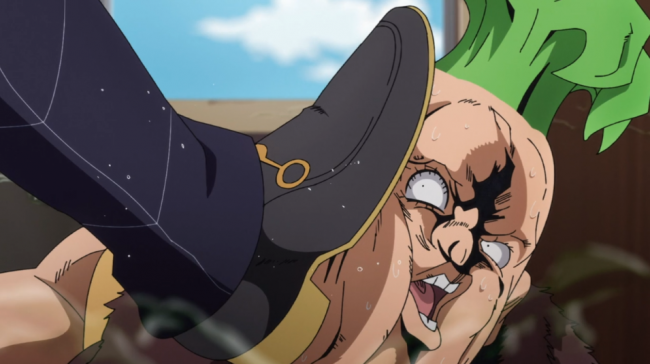 Posted on January 22, 2019 by WooderonPosted in Anime, Condensed Reviews:Tagged crunchyroll, golden experience, Golden Wind, jojo, jojo’s bizarre adventure, sticky fingers. Previous Previous post: What’s going on for the future of the Marvel Cinematic Universe?